Pc Protection, Pc Enclosures, Pc Security, Hardware Protection. If you are searching for any of the following topics: PC protection, PC enclosures, pc security, hardware protection and computer enclosures, you will find it here. · All in one enclosures, printer stands, lockable keyboard protection. · Stainless Steel PC's sealed to IP67 or IP65. · Keyboards suitable for industrial use, waterproof keyboards. 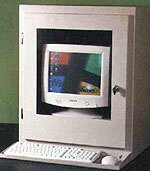 PC Guard manufacturers PC enclosures to protect computers. If you use standard PC equipment in harsh environments or if you are concerned about theft of vital hardware, a PC-Guard enclosure is the ideal solution. Dust and Dirt Filtered air supply with a positive internal air pressure to protect against airborne dirt and debris. Vandalism and Theft Rugged steel case to protect against physical damage. Fluids (Oil, water, etc.) PC-Guard enclosures fronts are sealed to IP54 (Optional IP65). Tampering Security locks to deter tampering and theft. Mains power spikes (dirty power supply) Optional mains filtering to protect PC's against dirty mains power supply and spikes.